At 0901 all are cut off, no signal 1100, 1300 & 1500. 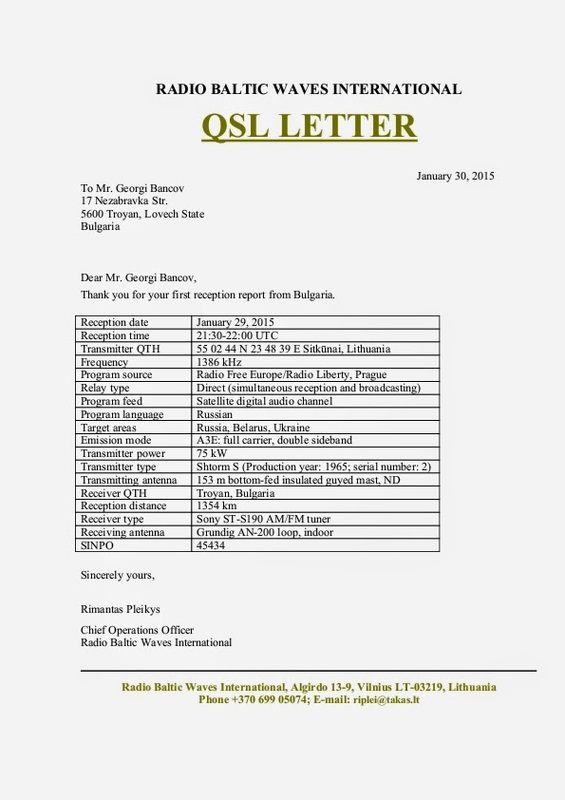 Today I received a nice QSL letter from Rimantas Pleikys, confirming my yesterday's reception of the Russian program of Radio Liberty/Radio Free Europe. Reception was relatively good and interference-free, save for some occasional fading. 1910-2000 on  9430 ABS 250 kW / 005 deg to EaEu, no signal, tx off at 1910UT! Tue-Sat and Viva Miami Sun/Mon and 0030-0100 Radio Ukraine International Daily. 0000-2400 on  6040 CUR 010 kW / 020 deg to SoAm Portuguese, no signal un BUL! Using remote receivers units in Kensington, NH and Mid State, NY. 1000-1100 on  6070 ROB 010 kW / non-dir to CeEu Sat Feb.14 KIM FM Nijmweg. 1000-1100 on  6070 ROB 010 kW / non-dir to CeEu Sat Feb.21 KIM FM Nijmweg. 1000-1100 on  6070 ROB 010 kW / non-dir to CeEu Sat Feb.28 KIM FM Nijmweg. 1000-1100 on  6070 ROB 010 kW / non-dir to CeEu Sat Mar.07 KIM FM Nijmweg. 1000-1100 on  6070 ROB 010 kW / non-dir to CeEu Sat Mar.14 KIM FM Nijmweg. 2330-2400 on 11580 YFR 100 kW / 044 deg to WeEu English Daily Radio Ukraine Int. 0030-0100 on  7455 YFR 100 kW / 285 deg to WNAm English Daily Radio Ukraine Int. 1100-2300 on 11730 MNS 100 kW / 246 deg to WeEu Bel/Ru/Pol/Ge/Fr/En/Sp/Ru. from 1700 on  9935 AVL 100 kW / 285 deg to WeEu Greek or 11645 are off! from 0715 on 11645 AVL 100 kW / 182 deg to NoAf Greek, or 9935 are off! 1400-1500 on  9875 SAL 010 kW / non dir to Eu in CLSB mode, strong QRMing! 0100-0200 on  5925 SLA 250 kW / 063 deg to SoAs English, addit. freq. 0200-0300 on  9920 TAC 100 kW / 131 deg to SoAs English, addit. freq. 2200-2300 on  3915 SNG 100 kW / 160 deg to SEAs English, addit. freq. 2200-2300 on  5890 NAK 250 kW / 045 deg to EaAs English, addit. freq. 2200-2300 on  5890 NAK 250 kW / 150 deg to SEAs English, addit. freq. 2200-2300 on  6195 SNG 125 kW / 000 deg to SEAs English, addit. freq. 2200-2300 on  6195 SNG 125 kW / 090 deg to AUS  English, addit. freq. 2200-2300 on  6195 SNG 250 kW / 013 deg to EaAs English, addit. freq. 2200-2300 on  7490 NAK 250 kW / 025 deg to EaAs English, addit. freq. Around 1015 ERT Open was gone air. 0100-0200 on  5925 SLA 250 kW / 063 deg to SoAs, addit. freq. 0200-0300 on  9920 TAC 100 kW / 131 deg to SoAs, addit. freq. 2200-2300 on  3915 SNG 100 kW / 160 deg to SEAs, addit. freq. 2200-2300 on  5890 NAK 250 kW / 045 deg to EaAs, addit. freq. 2200-2300 on  5890 NAK 250 kW / 150 deg to SEAs, addit. freq. 2200-2300 on  6195 SNG 125 kW / 000 deg to SEAs, addit. freq. 2200-2300 on  6195 SNG 125 kW / 090 deg to AUS , addit. freq. 2200-2300 on  6195 SNG 250 kW / 013 deg to EaAs, addit. freq. 2200-2300 on  7490 NAK 250 kW / 025 deg to EaAs, addit. freq.